Back at San Diego Comic-Con 2017, those lucky enough to be attending the Marvel Studios panel got the world’s first glimpse at Brie Larson’s look in Captain Marvel through a piece of concept art which displayed Carol Danvers in her iconic red, blue and gold costume. As these things do, this then leaked online via secondhand pics snapped on phones but the official version never materialized. Until now, that is. Marvel’s director of visual development, Andy Park, took to Twitter today to share the concept art properly, taking the opportunity to gush about how much fun he had working on the upcoming movie as well as citing the two comic book artists that inspired the MCU’s design for Captain Marvel the most. 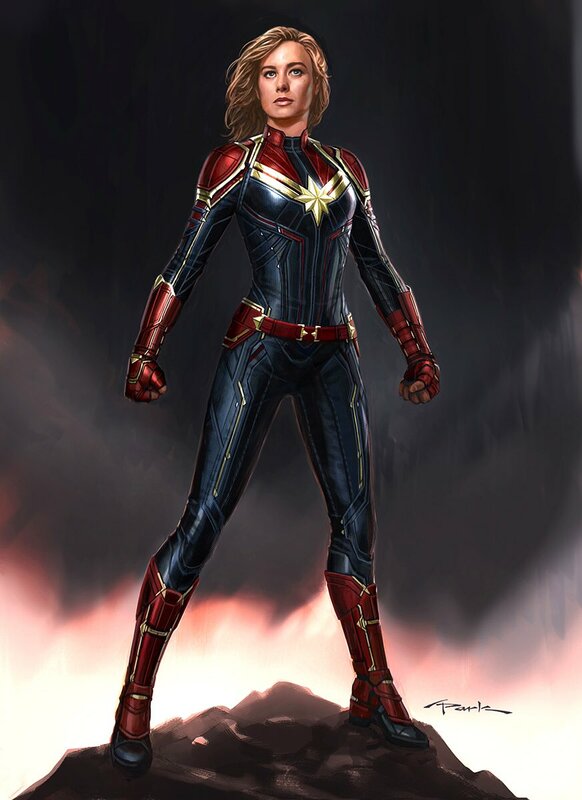 Now that we’ve seen Captain Danvers in action in the first trailer for her first solo film, it’s clear that the costume designers stuck very closely to Park’s concept art. That’s not surprising, either, considering it’s a really impressive piece. The suit is brighter than most in the MCU which gives it more of a comic book-y feel but it still has that practical, military edge that makes it believable. The only fault is the character’s missing sash, even though we thought we saw that in Avengers: Infinity War. Of course, Carol won’t wear the red and blue costume all the way through Captain Marvel, as she looks to start out in a green version of the same outfit, which appears to be the uniform of Starforce, the Kree elite squad that the heroine’s been a part of since she lost her memory and gained her superhuman powers. However, the trailer suggests she’ll have suited up in full color by the big final act. Watch out for Captain Marvel to fly into theaters this coming March.